On April 11 we commemorate the anniversary of the repose of Archbishop John. Archbishop John [Garklavs] was born in Umurga, Latvia on August 25, 1898. He and his two younger brothers were raised by their widowed mother in a small provincial village of Limbazhi, some 80 miles from Riga. Active as a child in the life of the Church as a server and reader, he graduated with honors from the Theological Seminary in Riga, Lavtia. He was ordained to the diaconate and priesthood in 1936. In 1942, following the repose of Bishop Alexander [Vitols], he was elected Bishop of Riga and All Latvia and consecrated the following year after a period of preparation at the Holy Spirit Monastery in Vilnius, Lithuania. Caught up in the turmoil of World War II, he, together with his mother and an adopted son, Sergei — the future Archpriest Sergei Garklavs — were forced to leave Latvia with the invasion of Soviet forces in 1944. They, with a small group of Latvian priests, took refuge in southern Czechoslovakia and eventually arrived in West Germany with the help of US troops. In West Germany, Bishop John ministered to many Orthodox Christians who found themselves in displaced persons’ camps. Having petitioned Metropolitan Theophilus to accept him into the Metropolia, as the Orthodox Church in America was known at the time, Bishop John arrived in the US on July 22, 1949. In October of the same year, he was appointed Bishop of Detroit and Cleveland, at the time a distinct diocese. In 1955, he was appointed Administrator of the Diocese of Chicago and Minneapolis. He was confirmed as the ruling Bishop of the Diocese and raised to the dignity of Archbishop in 1957. Concurrently, the parishes previously under the Bishop of Detroit and Cleveland were transferred to the jurisdiction of the Bishop of Chicago and Minneapolis. During his tenure he served as senior Bishop of the Holy Synod, as Chairman of the Department of Music, and in many other capacities. He retired in September 1978 and fell asleep in the Lord on April 11, 1982. Archbishop John is especially remembered as the Guardian of the Wonderworking Tikhvin Icon of the Mother of God, which came into his possession after it was taken to Riga by German forces from Tikhvin, Russia. He and his adopted son, the future Father Sergei, took the icon under their care with the intention of returning it to Russia when conditions permitted. 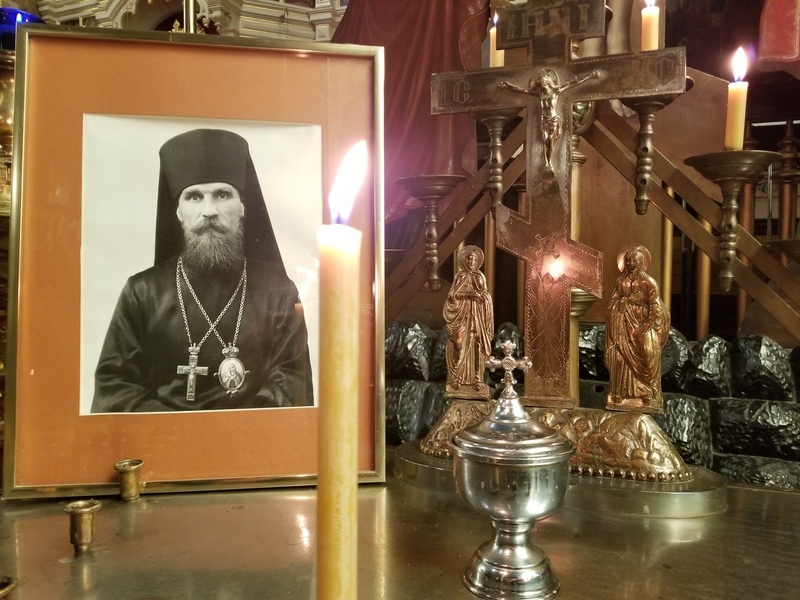 For many years the Tikhvin Icon was enshrined in Chicago’s Holy Trinity Cathedral under Archbishop John’s care and, after his repose, that of Father Sergei. In 2004, after the collapse of the Soviet Union, Father Sergei fulfilled Archbishop John’s promise as the icon was returned to Tikhvin and once again enshrined there. A memorial service will be held at the Cathedral at 6pm.